Former President Barack Obama is rallying in Milwaukee for Democratic candidates up and down the ballot Friday afternoon. He is arriving in Wisconsin two days after President Trump spoke in Mosinee to support Republican candidates. Former Vice President Joe Biden is expected to make a campaign appearance in the state next week. Obama's speech an extended version of others he has given on the campaign trail this year, primarily urging attendees of the rally to vote in his speech. "I am here for one simple reason. I am here to ask you to vote. To vote in what might be the most important election in our lifetimes," Obama said. "The consequences of anybody sitting out of this election are profound." Obama said that the most critical movements in the country, such as civil rights, only occurred "because we got out there and did the work" by volunteering, mobilizing and voting. He also implicitly rebuked the "cynical" politics of Republicans and Mr. Trump. "The powerful and the privileged try hard to keep what they got. And they will try to make you angry, and cynical, and distracted," he said. "They'll tell you that 'Everything will be okay as long as we get rid of the people who don't look like you.'" Obama also defended his legacy, saying that Republican rule before his presidency had resulted in a financial crisis, and "Democrats had to come in and clean it up." He argued that current economic growth began with his presidency. "When folks now about 'oh the economy's doing so well,' where do you think that started?" Obama said, to cheers. "Come on. Tell the truth." He also criticized Republican accomplishments since he left office, such as the tax overhaul and the raising of the deficit. Obama also referred to the investigation by Special Counsel Robert Mueller, which has indicted people involved with the Trump campaign. "Nobody in my administration got indicted," he said, to cheers. However, his main focus was on policy, and he spent much of his speech discussing the Affordable Care Act, which he spearheaded and which Republicans have tried to appeal. Obama noted that current Wisconsin Gov. Scott Walker had run campaign ads saying that he would protect preexisting conditions, even as Wisconsin is involved in a federal lawsuit to repeal the ACA. Obama also hit Republicans for criticizing Hillary Clinton for using a personal email server as secretary of state, but not responding strongly to a New York Times report that Chinese intelligence was eavesdropping on Mr. Trump on his "iPhone that he leaves in a golf cart." He criticized Mr. Trump for telling falsehoods. "If you can just say anything, and there are no consequences if what you're saying isn't true, then how are you going to have accountability?" he said. Obama also said that the press was part of the problem, criticizing the media for falling for Republican "fearmongering," but he said "I guess they can't help themselves." Obama ended with a rousing appeal to civic duty. "I am hopeful that despite all the noise, and the lies, and the distraction, we are going to cut through all that and remember who we are," he said. "The antidote to government by a powerful few is government by the organized, energized many." Wisconsin was a critical state in the 2016 elections, swinging to support Mr. Trump by a narrow margin, so national Democrats are eager to retain a Democratic Senate seat and capture the governorship. 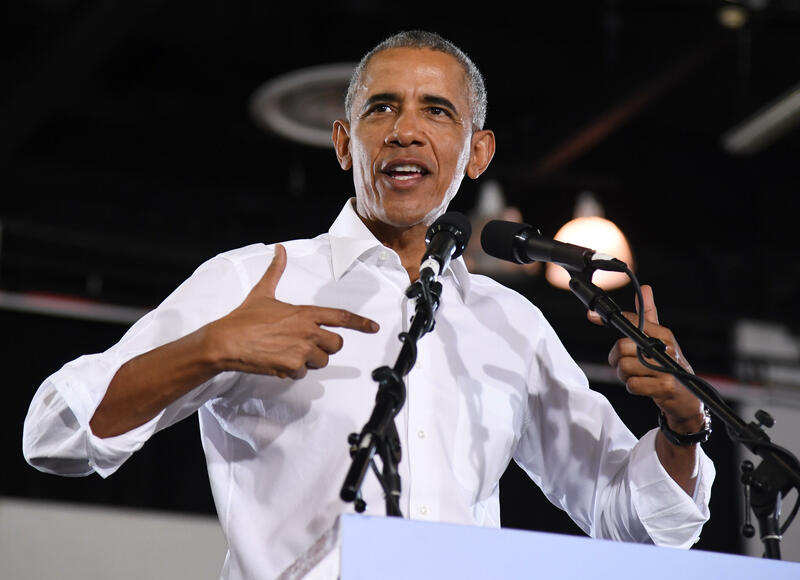 Obama rallied for Democratic Sen. Tammy Baldwin, who is facing Republican Leah Vukmir, and Democratic gubernatorial candidate Tony Evers, who is running against Walker. The CBS News Battleground Tracker rates Baldwin's race as "Likely Democrat." Randy Bryce, the Democratic candidate for the district House Speaker Paul Ryan is vacating, will also appear at the rally. Like Mr. Trump, Obama has ramped up his presence on the campaign trail in recent weeks, in an attempt to turn out voters who may have sat out the 2016 elections. At a rally in Las Vegas, Nevada, earlier this month, Obama said that the biggest threat to democracy was "indifference." "The biggest threat to our democracy is cynicism that says, 'We're just gonna stay home because my vote doesn't matter,'" he said. Cesar Altieri Sayoc, the suspect in connection with packages containing explosive devices that were sent to prominent Democratic figures across the country, including Obama, was arrested Friday. Mr. Trump is rallying in Charlotte, North Carolina, Friday evening.